High winds over Hawaii will delay the launch of a NASA saucer-shaped Mars landing test vehicle until at least the end of the month, project officials said Thursday (June 12). The space agency was forced to scrub six launch attempts over the past two weeks — the latest and last planned for this Saturday (June 14) — as a result of unusually poor wind conditions at the U.S. Navy's Pacific Missile Range facility in Kauai, Hawaii. The balloon-launched Low-Density Supersonic Decelerator (LDSD) craft is intended to help NASA develop the means to land heavier spacecraft, and eventually humans, on Mars. Having reached the end of their reserved time at the missile range, the team is now working to reschedule for the end of June. "We have managed to negotiate with the range for the possibility of some additional days later in the month," Adler told Space.com during a call with reporters Thursday. "We're seeing in the long-term forecast, which isn't very reliable at this point, but we are seeing some significant changes in the weather patterns toward the end of the month that could indicate we would have some good days." The wind conditions are crucial for safely launching the rocket-powered LDSD test vehicle, which is to be lofted to 120,000 feet high (36,600 meters) under a huge helium balloon. "We [cannot] have very high winds near the ground so that the balloon is able to be launched and not be damaged by the winds," Adler explained. "We also have to have conditions where the higher level winds [will] take the balloon away from populated areas." 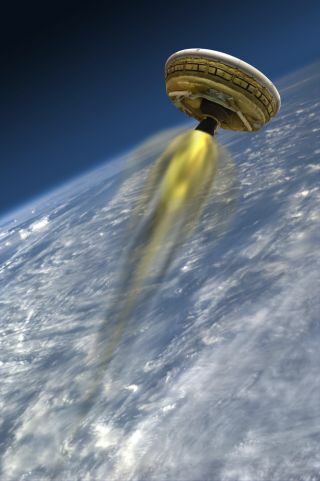 Once at altitude, the 6,800-pound (3,084-kilogram) saucer-shaped craft is designed to drop from the balloon and, a fraction of a second later, ignite a solid-fueled rocket engine to propel it to the edge of the Earth's atmosphere. There, the conditions simulate the kind of environment a future spacecraft will encounter when flying in the Martian atmosphere. The LDSD then deploys a device called a supersonic inflatable aerodynamic decelerator (SIAD), essentially an inflatable doughnut, which increases the vehicle's size and, as a result, its drag. Slowing from Mach 3.8 to Mach 2.5, a 100-foot-wide (30.5 meters) parachute — the largest supersonic parachute ever flown — is deployed. The saucer will ultimately splash down in the Pacific Ocean off of the Hawaiian Islands to be recovered. Adler said it remains crucial to the $200 million project to launch the LDSD this summer. "In terms of the schedule and to maintain the total cost of the project, we really need to get this flight off this summer — if not, it would have to be delayed to next year," he stated. "The only opportunities we have based on the previous wind studies [are] in the June, July and August timeframe." According to the team's data, the wind conditions for the same time period during past years would have supported a launch. Unfortunately, the weather this year has been quite different, Adler said. "It has actually been tantalizingly close to having acceptable launch weather," Adler told Space.com. "We had a couple of days where we were so close that we decided to proceed with launch preparations and then checked the weather again 12 hours before and found that, in fact, it was continuing to go in a bad direction." While the winds have caused a delay, the weather is just a "hiccup" on the longer path to Mars, said Ian Clark, the LDSD principal investigator at JPL. "I'm reminded that the journey to Mars is longer than the eight months it takes to go from Earth to Mars in a spacecraft," Clark said. "It is the years preceding it, in terms of development, testing, re-testing, fabrication and all the launch operations that go into the years of hard work. A little delay like this associated with the weather is hardly even a hiccup along that timeline."